In previous articles I’ve discussed the “mystery religion” of Babylon. We saw that once God scattered this false religion at the Tower of Babel, it spread to other countries across the globe (Genesis 11:1-9). But what is a mystery religion? Since the AGENDA of a mystery religion is too heinous for any ordinary man to accept, the top of the hierarchy (Satanists) hide their agenda through layers. 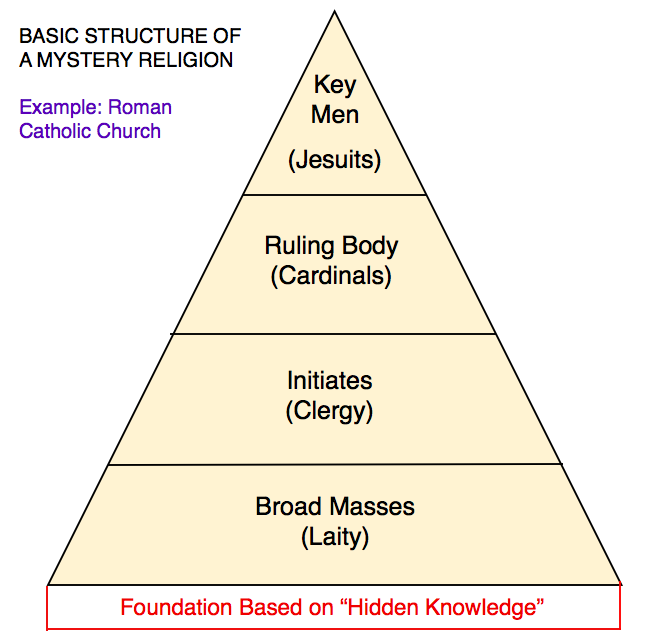 As members of the Mystery religion prove themselves “worthy”, they are promoted to higher levels in the hierarchy. 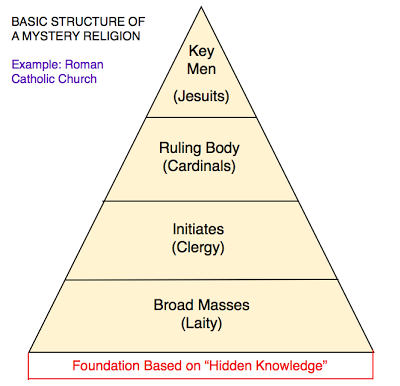 The “broad masses” or laity have no idea what the agenda of the mystery religion is. The “Initiates” are given pieces of the puzzle but are kept in line by the “Ruling Body”. The men at the top or “Key Men” are Satanists. In Misdirection I showed you how the mystery religion of Nimrod and Semiramis spread throughout the world but CONSOLIDATED in Rome. Rome became the SEAT of Babylon expressing itself through the Roman Catholic Church. We can actually follow its treacheries throughout time. InThe Society of Jesus I showed you how these treacheries came to a head with Martin Luther “protesting” the Roman Catholic Church. The Pope was beside himself. Due to the Reformation, the spotlight was on him. There had to be a way to divert attention away from Rome. In 1585 A.D., Francisco Ribera, a priest in the Society of Jesus came up with a doctrine we now call FUTURISM. This doctrine was created for the sole purpose of protecting the Papacy. Ribera spun his tale around the 70 weeks of Daniel (Daniel 9:24-27). He said that the first 69 weeks of Daniel’s prophecy ended with the baptism of Jesus in 27 A.D.. He said that the 70th week wouldn’t take place until the end of the age. He said that the antichrist would be a single person (not the papal system) and wouldn’t rule until the very end of time. Today this doctrine is known as the Pre-Tribulation Rapture theory. Of course Ribera’s doctrine was NOT received by the reformers of his day and it was soon forgotten. Then in 1826, Dr. S.R. Maintland, the librarian to the Archbishop of Canterbury, discovered Ribera’s book in his library. He translated it and published it in 1826. Dr. Maintland also wrote a prophetic pamphlet showing his contempt for the Reformation (Martin Luther). He did not believe that the papacy was the predicted System of Antichrist or Beast of Daniel or the Apocalypse (Revelation). Then John Nelson Darby (1800-1882) a brilliant and well-educated man from Glasgow, Scotland, magnified Maintland’s errors. Darby read the pamphlets that Maintland produced and was persuaded. Darby was the founder of the Plymouth Brethren. He thought this was a great revelation—with such a simplified view of Bible prophecy, there was no need to understand the historic application. It was all in the future! 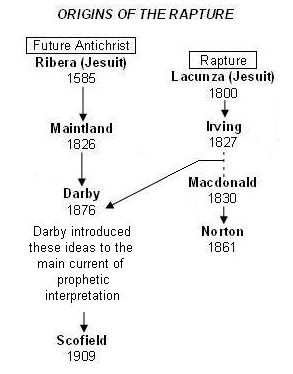 Darby wrote several volumes on this new understanding of prophecy. He influenced many people, including Cyrus Ingerson Scofield (1843-1921) who incorporated Darby’s views in the Scofield Reference Bible in 1909. Simultaneously to Maintland, a book called The Coming of Messiah in Glory and Majesty by Emmanuel Lacunza (1731-1801), a Jesuit priest from Chili, was translated into English and published in London in 1827 by Reverend Edward Irving(1792-1834). It contained the first known reference of a secret “rapture”. Irving presented Lacunza’s work as a new revelation from God. Irving became one of the most eloquent preachers of his time. In 1828, Irving’s open-air meetings in Scotland drew crowds of ten thousand people. In March 1830, he held a series of prophecy meetings in which he introduced Lacunza’s ideas about the Rapture. In 1830 in Port Glasgow, Scotland, a 15-year-old namedMargaret MacDonald claimed she had received a vision of a pre-tribulation rapture. Robert Norton (1807-1883), recorded Margaret’s prophecies and published them in a book, The Restoration of Apostles and Prophets in the Catholic Apostolic Church. It isn’t clear as to whether Margaret ever heard of Irving’s translation of Lacunza’s book, but Norton wrote that Miss MacDonald was the first to advance the idea of pre-tribulation rapture (Margaret MacDonald’s vision is recorded in The Incredible Cover Up). The rapture doctrine today is quite different from the rapture doctrine that Lacunza, MacDonald and Norton promoted. These nineteenth century believers proclaimed a partial rapture in which only a select portion of the body of believers would be chosen. The identity of this elite quickly became a focal point of confusion and disagreement. Lacunza claimed that only those believers who partake of the sacrament of the Eucharist would be raptured; Miss MacDonald said the rapture would take away only those who were filled with the Spirit; and Norton claimed that only Christians who were sealed by the Holy Ghost with the laying on of hands would be raptured. 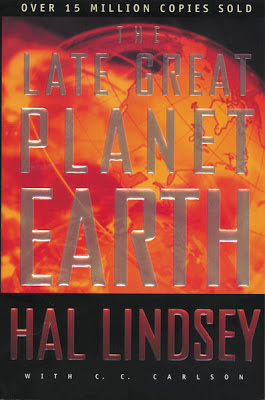 In the years that followed, the same John Nelson Darby mentioned earlier developed the teaching into its current form. It was Darby who introduced this new teaching into the main current of prophetic interpretation. 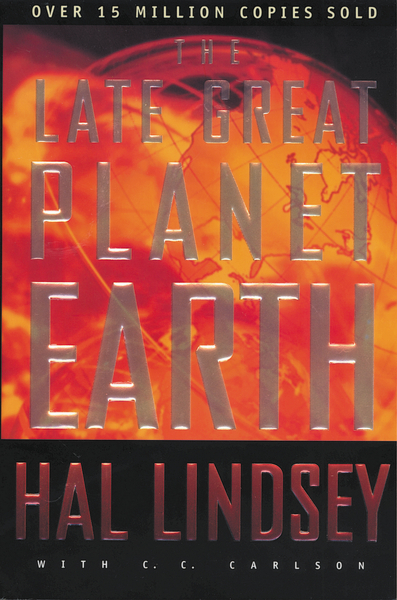 Also in 1970, Hal Lindsey further popularized it through his book, The Late Great Planet Earth— and Tim LaHaye through the Left Behind book and movie series. Both of these men are now known to be Jesuits of Rome (see the video below). 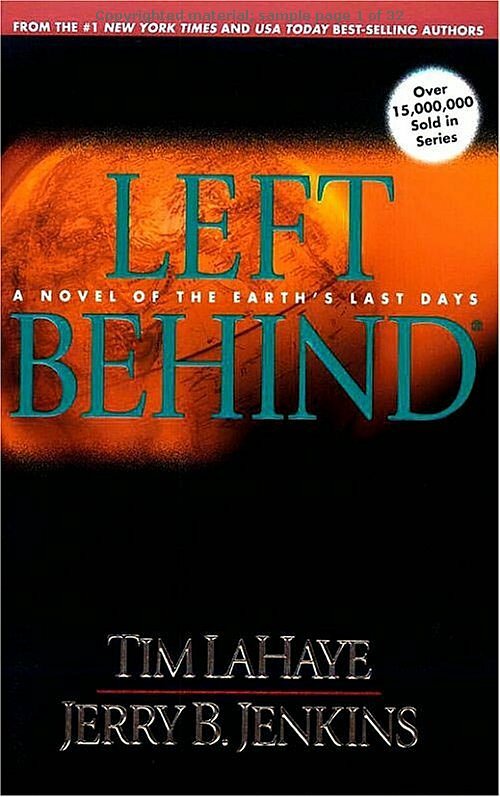 No where in my studies do I find the idea of a SECRET pre-tribulation rapture. The Bible DOES teach the concept of a rapture, BUT only as it coincides with the Day of the Lord or Day of Atonement at the end of the tribulation (the Bible does not use the term “rapture”). 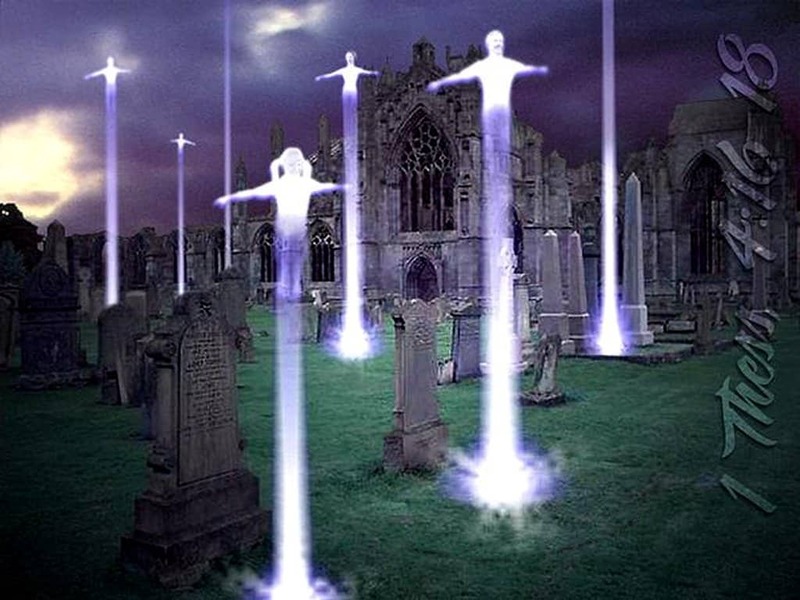 The rapture occurs at the Last Trump which is the Feast of Trumpets. The Feast of Trumps coincides with the Day of the Lord (Day of Atonement) in that it occurs just 10 days before it on Christ’s prophetic calendar. We understand this when we study the Feasts of the Lord. It’s the church FALLING AWAY from apostolic truth! The early church NEVER believed in a pre-trib rapture. The Reformers NEVER believed in a pre-trib rapture. Only the CURRENT CHURCH believes in a pre-trib rapture. It has fallen away from a post tribulation, SINGLE EVENT rapture and coming of the Lord. The apostasy of a Pre-tribulation Rapture has been brought upon us by FUTURISM, a Jesuit, Rome inspired doctrine to keep our eyes off the POPE and the mystery religion of Rome. The following videos are a must see. The author, Alan Lamont is highly qualified to speak on this subject having researched it for many years. 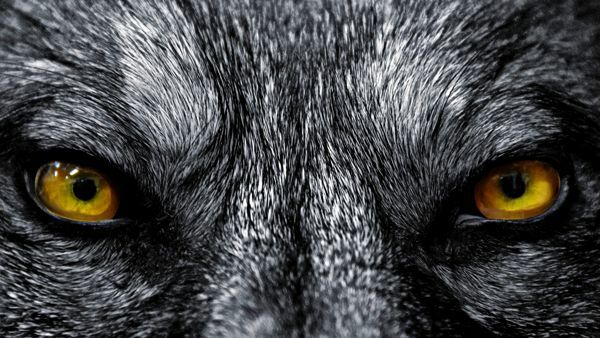 He reveals that Hal Lindsey, Tim Lahaye, Rick Joyner are nothing more than Jesuits wolves! He feels that the Calvary Chapel movement is culpable in that it supports them. You are SO blessed to be able to do all this wonderful work. I have met MANY people in my life, but none as open to ALL TRUTH as you. And I am not flattering you; what I say always comes from my heart. Thank you for finding me and being my friend. Thank you so much Renette! Your encouragement means a lot to me! I haven’t been receiving my email prompts for comments on the site recently so I apologize for the delayed reply!